Fresh off the loom, a new series of woven shibori scarves. 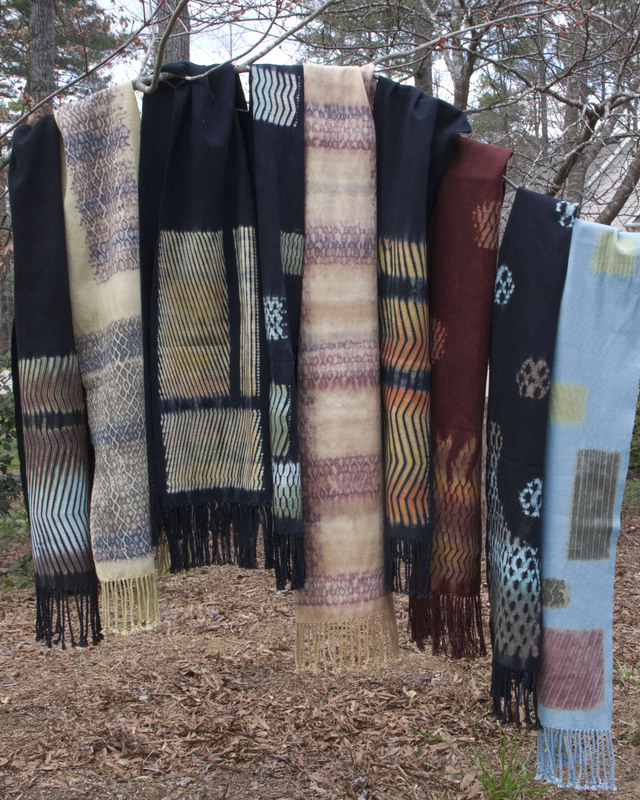 These scarves are 100% cotton and each has a unique pattern. Woven Shibori is similar to tie-dye, however instead of using rubber bands to create the pattern, I make the pattern while weaving the scarf. These scarves start with white yarn. I weave 1/4″ – 1/2″ of plain weave, then insert a slippery pattern thread – at least 100 pattern threads – that will be pulled to make the pattern. Each scarf goes through two series of dye baths to create these amazing colors and patterns. See more details of these scarves in the Wearables section of my website Gallery. 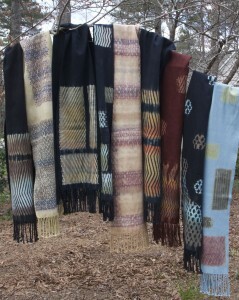 These scarves and more will be for sale at First Friday on April 6. I will be joining Lori White , contemporary realism painter, at her studio in the Carter Building, 12 – 22 Glenwood Ave. Raleigh. Stop by for a visit. I’d love to see you on April 6. That’s very nice Scarf . I wish I can learn how to make those . I like the dark one’s with bright colors and the cream color scarf is nice too. I was looking on your website. and I got the email from you . Hi Shayni, I’m glad you like the scarves. Thank you for the nice comments.